I am having a break in South West Ireland staying at the Thatch Cottage fishing lodge and being guided every day according to the weather and conditions onto different species of fish by the host here John Quinlan. You can read about his operation here https://kerrybassfishing.com/ . Suffice it to say that this is my third visit here, over the years and John is a master of his trade guiding anglers from all over the world onto the unspoilt and many different types of fishing available here. John’s wife Lynn ably supports the operation with great food morning to night. This time we started on day one on a mountain lough or tarn. It empties via a stream into the sea a few miles away and supports a small run of sea trout and salmon as well as a population of hardy small brown trout. The scenery is absolutely beautiful and so quiet. My fishing buddy Bill and I caught many small trout and enjoyed a great first day. Day two dawned to a plan to go after sea bass. 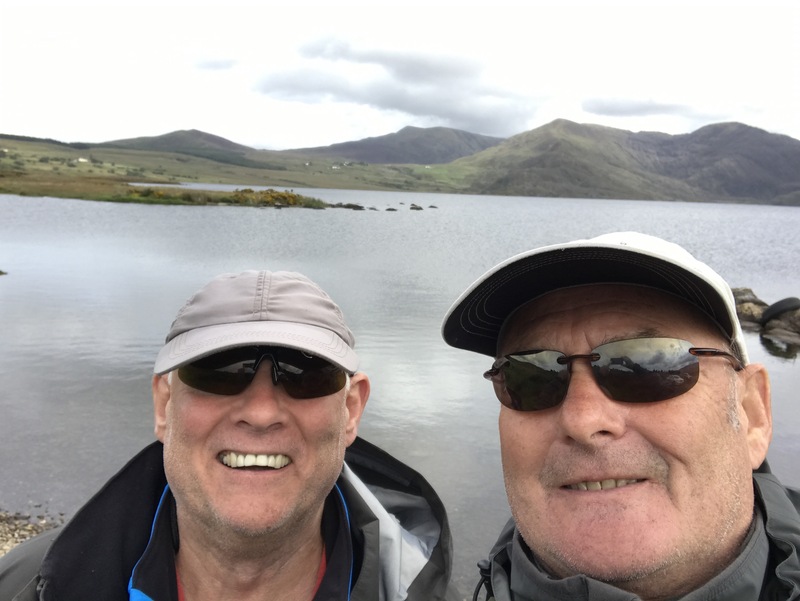 We drove to an area of great natural beauty called Glenbeigh which looks across an inlet to the beautiful Dingle Peninsula. I have caught bass before but only once before using a fly rod, and then only a small bass. You cast out a small fly which imitates a baitfish and draw it back through the channels in the estuary hoping that they are at home. My luck was in and I caught one which improved my personal best. The surroundings again were beautiful. Day three dawned to great weather and an outing in John’s 19 foot boat out into Ballinskelligs bay. The target for today was to try to catch pollack on the fly rods and also to go a bit further out to target some larger pollack to take back home for the table. Both objectives were achieved, again against the most picturesque of backgrounds. On day four conditions were right to do something I have always wanted to do which is catch a mullet on the fly. John Quinlan has perfected this but it takes the right conditions, knowledge, skill, patience and is based on the lifecycle of something called the kelp fly. If the wind is onshore at the top of a set of spring tides kelp gets washed up onto the high tide line and is stranded there until the next set of spring tides. If conditions are right, the kelp fly turns up and lays her eggs which go through the cycle of becoming maggots, pope and flies. The mullet are interested in the small 3 mm yellow or cream maggots that float. So at the next set of springs if the maggots are there they get washed back into the sea and make easy pickings for the mullet who instinctively know where and when to go looking for them. You can see a video of what is under the kelp here. https://youtu.be/KjkBCv39qxw . John has tied an imitation of the maggot which is in the picture below. You fish it with an indicator and a very light tippet. The mullet are extremely spooky and you need to wait until they are feeding confidently before offering them your fly. If conditions are not right for the maggots to wash in naturally, you collect them in a crate or wheelbarrow and chum the beach on an incoming tide. This was my result. Not huge but there are 6 lb fish out there. After the mullet fishing we walked a few hundred yards to a rock mark to try for pollack and wrasse. There were not any pollack but we had a field day on the wrasse. We were fishing with light spinning rods and dropping small plastics like flish minnows directly beneath our feet into about 15 to 20 feet of water. Again John’s knowledge was invaluable. It turns out that wrasse are highly territorial. They attacked our intruding lures time and again. Bill and I had around 6 fish each to around 5 lbs from two adjacent marks. I would not have believed that so many wrasse could be lying there under my feet. Next time we plan to target them with a sinking line and a crab pattern fly. On day five the weather broke and we fished an estuary for bass on the rising tide. I blanked but Bill had fish. The afternoon was a write off due to pouring rain but set us up for the next day going after salmon on the River Inney. The Inney is a spate river that has a small run of salmon and sea trout. It fishes well for a short window after a spate so we got our licences and over a few glasses of Guinness and wine eagerly anticipated the next day. You can fish the Inney with a single handed rod and it helps if you can Spey cast with the single handed rod. New rules this season are restricting to catch and release on single barbless hooks which makes landing any taker a bit of a lottery. I had three takes and landed one fish. I missed the other two by tightening up too soon before the fish had turned back down to its lie. I have paid a lot of money to fish much more prestigious rivers than the Inney and caught nothing, so my 2 out of 2 100% success on the Inney is again a tribute to John’s intimate knowledge of the river and the necessary conditions for success. Day six we opted to try for a bigger mullet and whilst we both caught the big one eluded us. We also fished a small stream looking for beautiful little wild brownies with yellow bellies and red spots. There is a species of trout in Ireland called a Gillaroo and these little chaps look just like them. « Am I Mechanical ? 🛠 🔩🔌🎚🔨⚒🛠🔬🎏⛱ ????? ?